A late season storm, not particularly strong, was moving across the Sierra as I was driving up SR88 on my way to Nevada where I planned to spend a 5-6 days tagging P1Ks around Yerington. It was 11p when I started to find the highway wet above 6,000ft and was soon enveloped in a fog. I slowed to about 30mph but found the driving somewhat straining. I came up upon a car that pulled over to let me pass, then promptly got on my tail, figuring he had someone to lead him through the fog. With heavy fog in front and headlights behind me, I got tired of this after about 15min. The next junction I came to I pulled over, found a flat spot to park the car and went to sleep in the back. That guy following me would have to find his own way over Carson Pass. Periodic drizzles would start up on the roof of the van, soon stopping, then repeating a few times before I drifted off. In the morning the weather had improved only slightly, the fog as thick as before but easier to navigate with the filtered daylight. The fog disappeared before I got to Kirkwood and would stay on the west side of the crest the rest of the day. I drove through Markleeville and up towards Monitor Pass where I planned to spend the day. The highest point around here is Leviathan Peak which I had climbed some years ago. Today I was after half a dozen other summits in the area. The weather was windy and overcast for almost the entire day. The ground and flora were wet in the morning which meant my boots and pants would be wet almost right out of the gate, but they would dry nicely by the afternoon before I finished. This peak has 500ft of prominence, but not much of a summit. The hike to the summit is only half a mile from the highway and I was up and down in short order. It does have a good view of Leviathan Peak. The view of the Sierra Crest to the west would also have been pretty good if it wasn't mostly buried in cloud layers. Peak 8,090ft is a P900 and the summit I was most interested in. I drove 1/3mi up a dirt road to an anglers' TH for Heenan Lake, a short hike away. I turned off the road as soon as I went through the gate, heading cross-country up towards Peak 8,090ft. There were some pretty wet and sloppy slopes to cross, a little frustrating but compensated by some fields of spectacular wildflowers. Upon reaching the summit, I was treated to some rainbow displays to the west where some light rain was still falling through the morning hours. Silver Hill overlooks Silver Creek and SR4 (closed for the Winter still) to the southwest. There are half a dozen other placenames with "Silver" in them around the area, but despite this, little silver was ever extracted. Silver Hill has little prominence and seems very unsummit-like from the northeast where I approached it. I imagine it must look somewhat better from down below at SR4. I followed a series of old jeep roads for the 1.4mi between the two summits. Some of these might still be in use, but they looked to see little, if any traffic. On the return it was necessary to go back and almost to the top of Peak 8,090ft again to get back to where I'd parked. These summits might just as easily be reached starting from SR89, saving the dirt road driving. This peak has been called "Monitor Pass Peak South" on PB, a rather long name but at least descriptive. It has 710ft of prominence and forms the highpoint of the ridge running south from Monitor Pass to Rodriguez Flat, twelve miles away. A Forest Service road heads south from SR89 about half a mile west of Monitor Pass. There is a whole network of jeep roads back in here (and in fact, on both sides of the highway around the pass) that can be explored. High clearance vehicles can drive nearly to the summit when the roads are dry. Parking at the highway, I hiked the three miles to the summit, making use of the roads for much of the route, some modest brush to deal with in the cross-country portions. 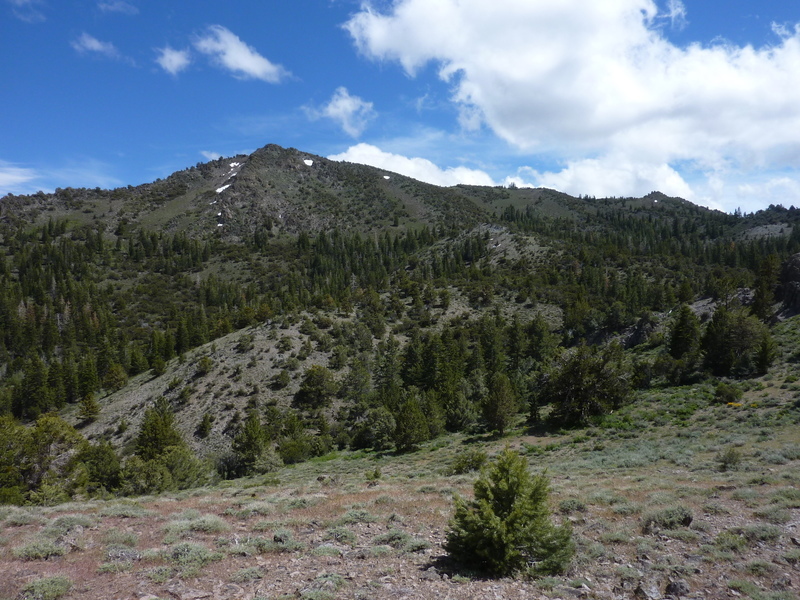 The hike is pleasant enough through high meadows and forest, all of it above 8,000ft. There was a large snowbank on the NE side of the summit, but it was easily bypassed on either side. The summit has a nice view of Slinkard Valley to the east and Bagley Valley to the west, the snowy crest of the Sierra still partly shrouded in clouds behind it. Are you seeing more snow around mountain passes in your recent travels. As far as I can tell Tioga Pass is still not open. I wonder if mosquitoes will be lingering on this summer. Sonora Pass just opened last week and I expect Tioga will open very soon. Definitely a lot more snow up there than normal. Water flow in creeks and rivers is phenomenal. Expect a bumper crop of mosquitoes. Drove over Sonora Pass this morning. Looks like Winter up there. The Walker and Stanislaus Rivers are going hard bank-to-bank. One thing I haven't seen in 45 years of Sierra slumming is the water color turned Brown a few days ago when this big warm up began. Chocolate milky muddy brown ! There is so much water, little if any rocks can be seen. All side creeks are also dangerous and hard to cross. In fact Douglas Creek below Kennedy Meadows is running right over the highway ! If one has the time to take the short hike up to the 2nd bridge above Kennedy Meadows, a mind boggling white water crashing confluence of Kennedy Creek and Summit Creek awaits.